Who likes to feel like their hands are in worm guts? You? The slimy inside of a pumpkin is a SCARY place. But, don't decide to toss out the seeds because it is to disgusting to separate them from the stringy orange stuff! This is a really great and nutritious snack food just waiting for you to stuff in your purse, lunch box, or backpack. When you are carving your pumpkin, use a bowl to collect the insides so you can glean off the seeds for a yummy snack. Pumpkin seeds are nutritious (ex: 28% of your DV of Iron in 1/4 cup) and they are easy to cook. They are a snack that will work in a nut free workplace or school. It makes me sad that so many people have nut allergies because nuts are really nutritious. If you can't eat nuts, then eat SEEDS. Seeds such as Sunflower Seeds are as nutritious as nuts, portable, and delicious. You can find packages of sunflower seeds and pumpkin seeds in convenience stores. The great thing about roasting pumpkin seeds yourself is that you can customize the flavor. Below, I have included a recipe that goes to the salty side of the taste spectrum. Add some cayenne and you will have a spicy and salty snack. You could try some sugar and cinnamon, or add pumpkin spice. Whatever your favorite spice flavors - just toss them on the seeds. I suggest trying 1/2 teaspoon for one cup of pumpkin seeds to start because you might overwhelm them with flavor. Please share your pumpkin seed ideas. Preheat oven to 350 F. Line a rimmed baking sheet with tin foil. 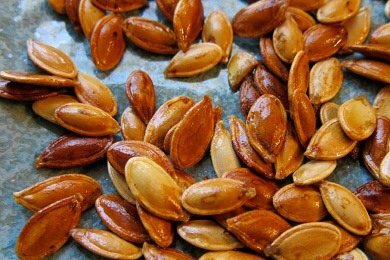 Remove strings from pumpkin seeds and put in a small bowl. Dry with a paper towel and mix in oil, salt, and spices. Put seeds on baking sheet and roast for 20 minutes (or until golden brown). Toss seeds after about 10 minutes to cook evenly (or you can skip it). We will DEFINITELY be roasting our own pumpkin seeds this year! I've been buying some organic roasted pumpkin seeds but they are EXPENSIVE!!! ($3.59 for 4 oz). I'd much rather make my own! Guess we better hit the pumpkin patch soon! I love, love, love roasted pumpkin seeds! It's my favorite part of carving pumpkins at Halloween. I do this every year! I get input from my 10 yr old sister-in-law about what kinds of spices to add for flavors. My favorites are chili-lime (just todd the seeds in a little lime-juice and add some chili powder) and ranch (I'm lazy about this one- I just get a packet of the dry Hidden-Valley dip mix stuff and toss it with the pumpkin seeds) Then I bag up all the flavors seperately and I have a variety to choose some when I want to throw them in with my lunch bag! My Hubby and I also make homemade pumkin pies our of our jack-o-lantern cuttings! not so healthy, but the best punpkin pies you'll ever eat! I just love the idea of roasting pumpkin seeds in sugar and cinnamon. I've always used salt and more savory flavors, and never liked them very much, but I think my sweet tooth would prefer adding other spices. Nutmeg would be good too, I bet. I love pumpkin seeds! We soak them for a couple of hours in salted water 1st though. It gets more of a salty taste inside the shell. Also, we use olive oil and stir them every 15 minutes and cook it for a lot longer, at least 45 minutes. I like them golden brown, toasty and crunchy! Roasted Pumpkin seeds make an excellent decoration for the tops of pumpkin or squash muffins. We've been eating pumpkin recipes lately, since they are so readily available and cheap. I always save the seeds for roasting. great alternative to candy corn on my office desk. I have a question? How long will roasted pumpkin seeds last? If I want to save a big stash should I put the raw seeds in the freezer? Hi Snackgirl, I've never roasted pumpkin seeds from the fruit before. I usually buy dry, shelled pumpkin seeds. After reading your post, I'd really like to try it. Are you supposed to peel off the shell before roasting or eating? Or do you eat everything, shell and all? Instead of roasting it, can you just fry it in a Tefal pan with a little oil? Roast the seeds with the stringy fibers on the seeds. When they are dried out, let them cool and the stringy stuff comes off much easier then before you roast the seeds. After removing the strings, use olive oil and the spice you like to finish the roasting process. I am interested in knowing if you are supposed to eat the shell or not. Seems like it would be a great source of fiber if eatable. Pepitas are pumpkin seeds, at least I think they are, that have been shelled and roasted. Yummy!